Planning a party and need a simple party decor idea? Look no further!! 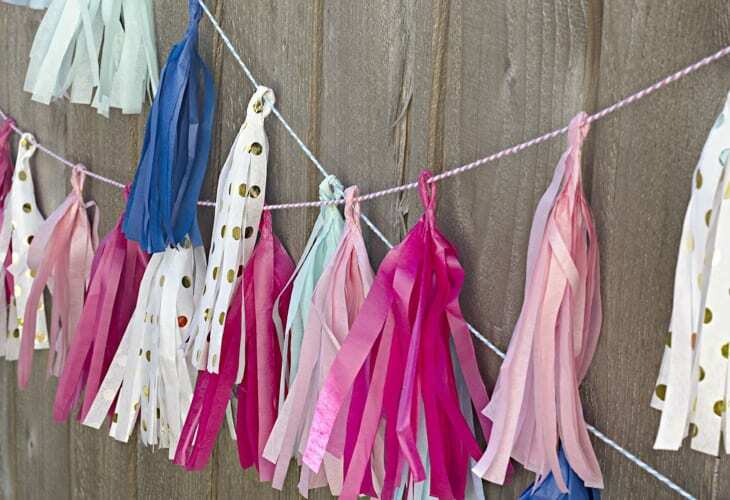 These tissue paper tassels make a perfect party garland that you can customize for any party! All you need is tissue paper that fits your party theme or style, scissors, and a hot glue gun. Seriously, so easy!! I knew it was easy but after looking around the inter-webs and getting myself all sorts of confused on how to fold the tissue paper and what to cut I decided to just wing it, figure it out, and then I’ll show you how to do it! So here we are! 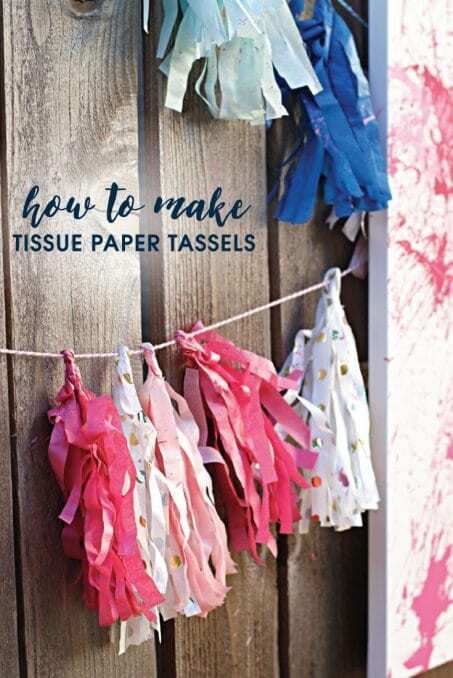 Finally, a simple video tutorial to show you how to make your own tissue paper tassels. Take one sheet of tissue paper. Fold it in half the long ways, in half again, and then in half again the short way so that the middle crease is on one edge. Cut thin strips starting on the open edge and leave a one inch gap from the folded edge uncut. Open tissue paper all the way and cut along folded crease into four pieces. Along the long edge, roll tissue paper fluffing the tails as you go so they don’t get stuck. I promise you…it’s way easier to untangle the tissue paper tails as you go then trying to untangle it all at the end. Once it’s rolled tight, twist the middle of the uncut tissue paper and then bend in half. Grab your hot glue gun and do a tiny dot of glue about half an inch down from the loop you’ve just created. Hold it tight until the glue dries and you’re done! These tissue paper tassels were so cute for our gender reveal balloon popping shindig a few weeks ago! Plus, you can find tissue paper in practically every color and style! These tassels are perfect to string on some cute baker’s twine and use as party decor or to hang in a little girl’s bedroom. I might just need to make some in purple and grey to match Clara’s new bedroom once we move her to her big girl room next month.